Investigating Yoitsu is an important thing that Kraft does not forget to do, but it is not actually the focus of this season. Like the previous season, the major events revolve around economic schemes in the pursuit of wealth and the drama which ensues. (Some might wonder how Kraft could have lasted as long as he did as a merchant given the risky schemes he takes part in, but I just chalk that up to him unconsciously trying too hard to impress the wolf god.) However, this time Kraft and Horo are more conscious of how they think of each other, while Horo has some emotional issues as the end of their journey together draws near. The high point of this series is the casual banter and other interactions between Kraft and Horo. I love seeing them talk with each other in a playful interplay of words. 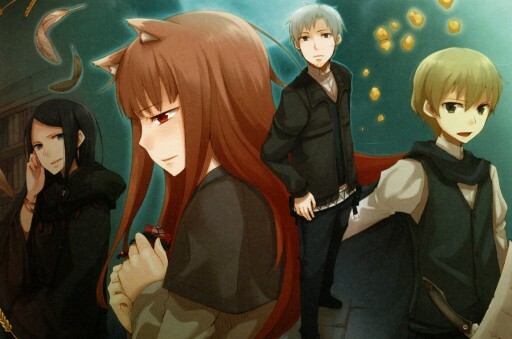 What Horo does with her tail and ears just makes the conversations that much better. The subject of economics that drives much of the plot was also mildly interesting, not only the schemes themselves but also how the merchants try to outwit each other. This does mean that much of the series revolves around talking, so it might not be to the liking of those who want a lot of action. And of course, it won’t be interesting to those who can’t get any enjoyment out of watching a merchant trying to make a buck.